(Nanowerk News) Scientists at the Helmholtz-Zentrum Dresden-Rossendorf (HZDR) and the University of Konstanz are working on storing and processing information on the level of single molecules to create the smallest possible components that will combine autonomously to form a circuit. 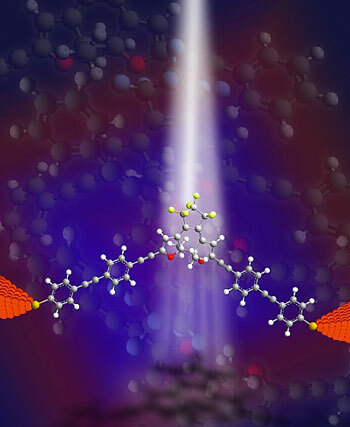 As recently reported in the academic journal Advanced Science ("Light-Induced Switching of Tunable Single-Molecule Junctions"), the researchers can switch on the current flow through a single molecule for the first time with the help of light. Dr. Artur Erbe, physicist at the HZDR, is convinced that in the future molecular electronics will open the door for novel and increasingly smaller – while also more energy efficient - components or sensors: “Single molecules are currently the smallest imaginable components capable of being integrated into a processor.” Scientists have yet to succeed in tailoring a molecule so that it can conduct an electrical current and that this current can be selectively turned on and off like an electrical switch. This requires a molecule in which an otherwise strong bond between individual atoms dissolves in one location – and forms again precisely when energy is pumped into the structure. Dr. Jannic Wolf, chemist at the University of Konstanz, discovered through complex experiments that a particular diarylethene compound is an eligible candidate. The advantages of this molecule, approximately three nanometres in size, are that it rotates very little when a point in its structure opens and it possesses two nanowires that can be used as contacts. The diarylethene is an insulator when open and becomes a conductor when closed. It thus exhibits a different physical behaviour, a behaviour that the scientists from Konstanz and Dresden were able to demonstrate with certainty in numerous reproducible measurements for the first time in a single molecule. A special feature of these molecular electronics is that they take place in a fluid within a test-tube, where the molecules are contacted within the solution. In order to ascertain what effects the solution conditions have on the switching process, it was therefore necessary to systematically test various solvents. The diarylethene needs to be attached at the end of the nanowires to electrodes so that the current can flow. “We developed a nanotechnology at the HZDR that relies on extremely thin tips made of very few gold atoms. We stretch the switchable diarylethene compound between them,” explains Dr. Erbe. Switching off, however, does not yet work with the contacted diarylethene, but the physicist is confident: “Our colleagues from the HZDR theory group are computing how precisely the molecule must rotate so that the current is interrupted. Together with the chemists from Konstanz, we will be able to accordingly implement the design and synthesis for the molecule.” However, a great deal of patience is required because it’s a matter of basic research. The diarylethene molecule contact using electron-beam lithography and the subsequent measurements alone lasted three long years. Approximately ten years ago, a working group at the University of Groningen in the Netherlands had already managed to construct a switch that could interrupt the current. The off-switch also worked only in one direction, but what couldn't be proven at the time with certainty was that the change in conductivity was bound to a single molecule. One area of research focus in Dresden is what is known as self-organization. “DNA molecules are, for instance, able to arrange themselves into structures without any outside assistance. If we succeed in constructing logical switches from self-organizing molecules, then computers of the future will come from test-tubes," Dr. Erbe prophesizes. The enormous advantages of this new technology are obvious: billion-euro manufacturing plants that are necessary for manufacturing today’s microelectronics could be a thing of the past. The advantages lie not only in production but also in operating the new molecular components, as they both will require very little energy.